I’m starting with the Sony VAIO L Series (VAIO VPCL21S1E/B) all-in-one (AIO) 3D touchscreen multimedia PC that should be available starting October this year. It is basically a 24-inch Full HD 3D-capable LED display with multi-touch support that has built-in PC components making it a full featured multimedia computer. The other hardware of the system includes a 2nd Generation Intel Core processor, Windows 7 Home Premium 64-bit OS, 8GB DDR3 SDRAM (1333MHz), 1TB HDD, NVIDIA GeForce GT 540M GPU with 1GB VRAM, Blu-ray Disc Drive with DVD SuperMulti, WLAN 802.11b/g/n, Bluetooth Ver 3.0 + HS, Hi-Speed USB 2.0 (x3), SuperSpeed USB 3.0 (x2), HDMI Output (x1), HDMI Input (x1), HD Web Camera powered by “Exmor”, S-Force Front Surround 3D, Dolby Home Theater technology, Internal stereo speakers 5.5W + 5.5W as well as wireless keyboard and laser wireless mouse. This AIO PC is intended for multimedia use including for previewing 3D photos and videos and movies, and while it may also provide decent gaming performance it is not being advertised as a gaming solution. Still it probably comes with 3D Vision support using Sony’s active shutter glasses and you may be able to play some not so demanding games in stereo 3D mode on it, although this functionality needs confirmation. This AIO PC from Sony will be able to convert 2D movies and videos to 3D at the touch of a button and also comes with Family Paint 3D software, allowing to to make 3D drawings using the touchscreen with up to 5 depth layers which can be quite fun thing to do with kids. 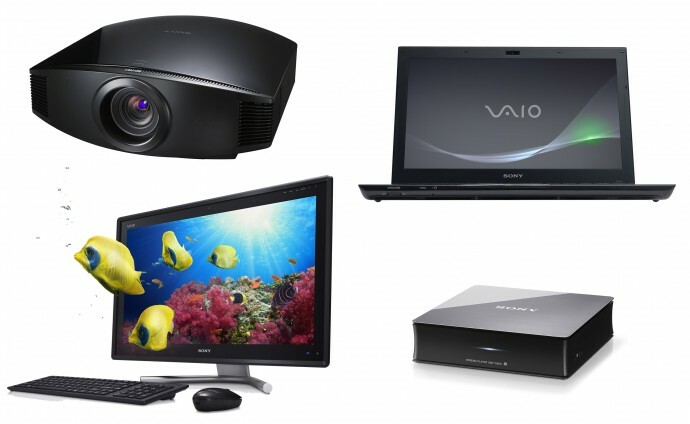 But this is also the first all-in-one PC with a 3D HDMI input, allowing this VAIO to display 3D video from a connected PlayStation 3 console or to use the console to game in stereo 3D mode. Up next is the 3D-capable Sony SMP-N200 Network Media Player that according to Sony should be able to turn any TV into an Internet TV, that is if your HDTV is not already offering Internet connectivity with a bunch of features associated with it. It is still not very clear what kind of video formats will the device support, also including the 3D formats, but it will apparently support the “3D Experience” service offering free of charge on-demand streaming of 3D content (only available in some countries) as well as other online features. Other non-3D features announced from Sony include the availability of a web browser for example, although browsing from a TV-like remote control has never been the most comfortable things to do. The device will feature USB, WiFi and Ethernet connectivity for accessing media from other devices and also supports DLNA. It will have HDMI, component video output and composite video output, but only the HDMI will be usable for 3D content since it should be HDMI 1.4-capable. Moving to the Sony VPL-VW95ES 3D projector, a high-end device intended for home cinema enthusiasts also interested in 3D support. Sony’s VPL-VW95ES projector is a successor to the VPL-VW90ES, which was announced last September, and was the company’s first 3D home cinema projector, so the new model builds on top of the successful previous one. It is a Full HD 3D-capable projector that uses HDMI 1.4 interface and is intended mostly for 3D movie lovers, although it can be used for stereoscopic 3D gaming as well with a game console such as the PS3 or any other compatible solution. The projector is equipped with Sony’s Advanced Iris 3 technology which includes a contrast enhancer to maximize the dynamic contrast ratio to up to 150,000:1, brightness of over 1,100 ANSI lumens and also supports 2D to 3D autoconversion. it is also expected to be available in October when probably we are also going to have more specifications about the device. Lastly there is also the new 15.5-inch Sony VAIO S Series laptop which is interesting because of the the optional VGP-FL3D15A ‘glasses-free’ 3D panel. This extra accessory is available as an option for VAIO S Series models configured with Blu-ray Disc drive, that you can apparently attache to the laptop’s LCD display and make it into an autostereoscopic 3D one (no glasses required to see the 3D effect). Not much details go about the accessory yet, but apparently when used you can also use the laptop web camera face face tracking to optimize the 3D experience you are getting. Of course since the laptop is intended as a light and portable solution, stereo 3D gaming is not recommended here with the present AMD Radeon HD 6630M discrete graphics apart from the integrated Intel one. The stereo 3D capabilities the laptop gets with the optional accessory are more like for multimedia use such as 3D video and movie watching and for previewing 3D photos. Especially considering the fact that the 2D resolution of the laptop’s screen is Full HD, although in stereo 3D mode it will be reduced, the added extra performance need for rendering two frames for the 3D output will be quite demanding. Again, just like all other products mentioned above, this one should also be available on the market in October.